This LO was for Liz's technique challenge using core CS a chippie and some sandpaper....loved it and will be using it again! Sweet dreams is the gorgeous Miss Morgan all tuckered out after her birthday party.......awwwww she is so gorgeous........and yes I am so biased! !Aunties are supposed to be LOL!! This is my spunky man Josh the title was an easy choice I do adore him :) always have since the first time I saw him........he's getting so grown up though.....to fast I think! !Im really pleased with how this one has turned out!I thought it was going to be a disaster when I dropped the ink pad on my white CS but I went with it and layered different colours of ink and I LOVE it!Heaps of distressing and some messy stitching and its done! Wow, that is stunjing work Krissy!! I think you need to call your sister more often when you are making cards!! Beautiful work again and Morgan does look so so cute!! that is some card Krissy! WOW! 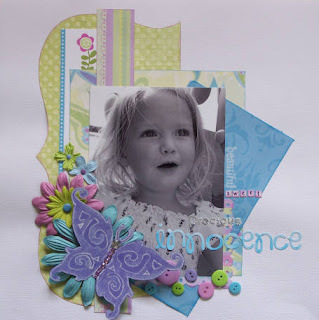 That is a stunning card Krissy and I adore your Morgan layouts - she is so very pretty in them.